Getting up early to watch others work hard. Weekend Preview – Go OTC! Ok, ok, yes, I am overdue on my Morro Bay race report. It is all written, just not formatted. Sorry. I’m busy thinking about days ahead! Two events this weekend: Alameda Holiday Kick-Off 5k Run/Walk (Supporting the Multiple Myeloma Cancer Foundation in honor of my teammate’s father), and the Berkeley Half Marathon! See? Light at the half-way tunnel. I’m running the 5k and volunteering at the half – I actually raced in the Berkeley Half last year and now I am very confident that I know what not-in-half-shape feels like (so, what I feel like). Find me and the rest of OTC at the end of the Frontage Road (the 9 mile turn around)! I know we have a few teammates running so I’ll be thrilled to see them, and hopefully they’ll be happy to see us too because honestly, that out-and-back sucked last year. Like really bad. I’ll pretend we’re the light at the half-way point of the tunnel. As for a 5k goal – according to Athlinks, which is an excellent resource if you haven’t used it before, my best 5k time is a 28:08. So I guess my goal is to break 28 minutes – 9 minute miles. I’ll let you know how that turns out. Author KJPosted on November 18, 2015 November 18, 2015 Categories Preview, Running, VolunteeringTags Oakland Triathlon Club, OTC, runningLeave a comment on Weekend Preview – Go OTC! 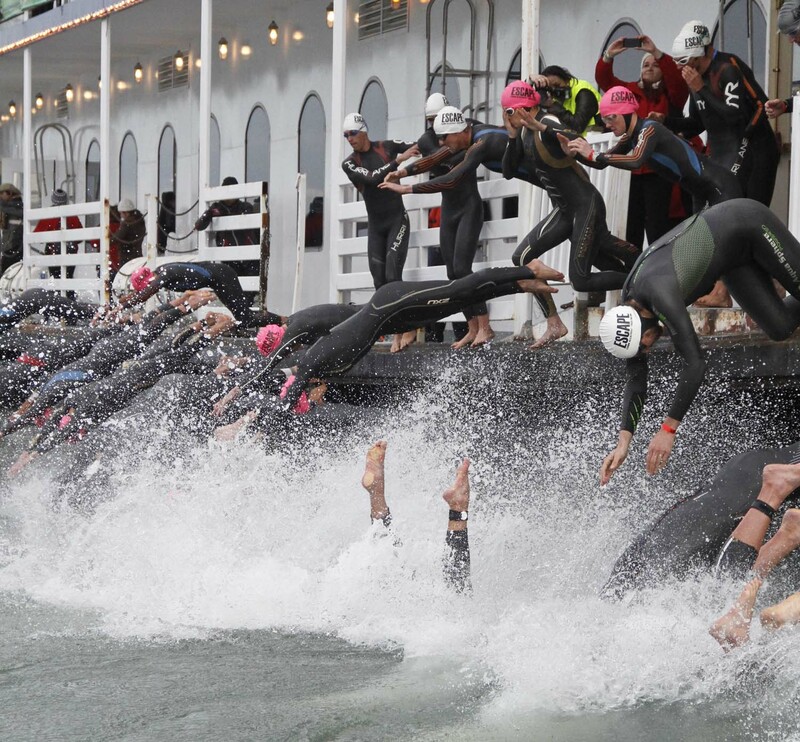 Escape from Alcatraz is one of the most iconic triathlon races in the U.S. and definitely is a bucket-list event for many people. I had the opportunity to volunteer at the swim exit with Oakland Triathlon Club for the 2015 race. I know what you’re thinking: “What could have motivated you to wake up so early on a Sunday when you aren’t competing?” Well, quite a few things, actually. See those feet? Ya, you know the ones. Don’t enter the water like that.